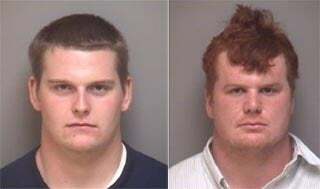 Their school already has the gayest of all mascots — not that there's anything wrong with that — so why shouldn't two University of Virginia football players be arrested for stealing beer from a gay bar? Yep, it happened Saturday. But here's the problem: They tried to run and got caught; and then of course there's the one guy's hair. As I'm sure was heard more than once at the scene: You should have been robbing a salon, sweetie. Two University of Virginia football players have been arrested at a downtown Charlottesville nightclub. Junior offensive lineman Will Barker and redshirt freshman lineman Dave Roberts were picked up at Club 216 on Water Street at 3:45 Saturday morning. Police say both men admitted to stealing beer from a cooler at the nightclub. Both face larceny charges. Roberts, who is 19 years old, is also charged with being a minor in possession of alcohol and with using a fake ID. Club 216, the gay bar in question, is technically a "private club." This is a common dodge once employed by bars here in Atlanta: call yourself "a club," charge for a "membership fee" complete with card, and then stay open much later than public bars. Places like Club 216 often do a thriving business as after-hours bars, which likely explains why football players — not known for being models of forward-thinking tolerance of all lifestyles — would be there. They had beer, and they were open. Still, this shouldn't stop any rival ACC students with Photoshop skills from doing their duty; Virginia's mascot may be getting a makeover in the next few days, I have a feeling. And in that vein, below are some images to get you started, guys.